A native of Jackson, Mississippi, John Egbert was born to hearing parents, but had a deaf brother, Billy, 20 months his senior. His parents had been counseled not to use sign language with the boys, so they were enrolled in a succession of oral schools. First came the Chinchuba School for the Deaf in Marrero, near New Orleans, Louisiana. "I was their poster child," he says, recalling that almost every Friday, the school gave public demonstrations to hearing audiences. At Chinchuba, he was stationed at a back blackboard, writing down endless series of multiplication tables while the teacher worked with the other students, who had a tougher time understanding her. "Even though I had a 75-decibel loss, I had the talent of picking up what the teachers were saying." After third grade, John and Billy were transferred to a hearing Catholic school, without any support services. "No longer a poster child, I became an instant nobody. . . . I missed a lot of what the teachers were saying." After 45 days of this, they were transferred to the public John Davison School in Algiers, just over the river from New Orleans. A special-ed teacher worked with the school's eight o r so deaf children. John and Billy commuted to school via bus and ferry each morning, and as they didn't get much help from their parents, were each other's support system. They explored New Orleans together, caught snakes in the swamps, and constructed treehouses and go-karts. John attended public school until 11th grade, and entered Gallaudet College . . . and got his first exposure to ASL. "Learning ASL changed my life," he says. "I accepted myself as a Deaf person and became much happier." He married a Gallaudet classmate, and they started a new family—two deaf children, Clyde and Stella. They were enrolled in a school for the deaf. John became increasingly concerned about the quality of education they were getting. Some 70 percent of their classmates were from mainstreamed backgrounds and didn't have any prior exposure to ASL. The kids learned it from each other instead of from the teachers. Although the school required students to attend speech-therapy sessions, almost all of them hated it because they were pulled out of their regular classes for it, and considered it a waste of time. They wanted more education, not more speech training. Yet this same school offered no classes in ASL. And this wasn't just a situation unique to this school or the state policy—it was happening all over the nation! And the superintendent told him that hearing parents were the dominant force in deaf-ed. This motivated him to write and publish a novel, MindField, but then he realized that it wouldn't reach the majority of those whom he wanted to reach, so he "decided to start a grassroots movement" to advocate for the right of deaf babies to have full and immediate access to sign language as the best way to develop visual-communication skills, cognition, "to learn how to learn." 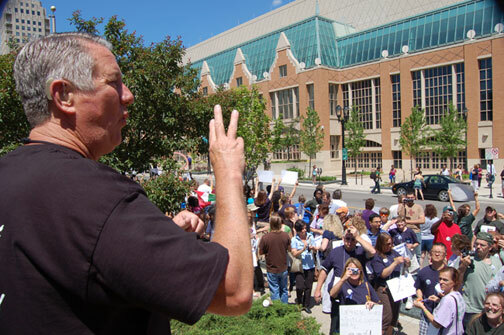 The grassroots movement he founded, the Deaf Bilingual Coalition, held its first national conference in Milwaukee, June 27-30, attracting several hundred attendees, Deaf and hearing, from across the nation and Canada. John participated, of course, doing person-to-person outreach with AGBell conference attendees. He urges parents to sign to their deaf children, to learn sign language, embrace it, use it as a basis for learning language skills. They'll be glad they did. He's been through it all; he knows what he's talking about.